The 32-bit Appocalypse truly is nigh. While there were hints that Apple was soon is going to start pulling 32-bit apps in future iOS versions, the final nail in the coffin has been delivered. Users of the iOS 11 beta will now be unable to install 32-bit apps at all, such as the TouchArcade app, which is unable to be updated due to Apple policy changes. At Platforms State of the Union, Apple confirmed that apps are going to 64-bit apps. High Sierra will also be the final macOS version to support 32-bit apps. I don’t know if Apple was saying anything with the Appocalypse video that kicked off the WWDC keynote, but it sure was appropriate, because with all the classic apps that otherwise still work not working any more, it’s going to be a sad day once iOS 11 goes into wide release. 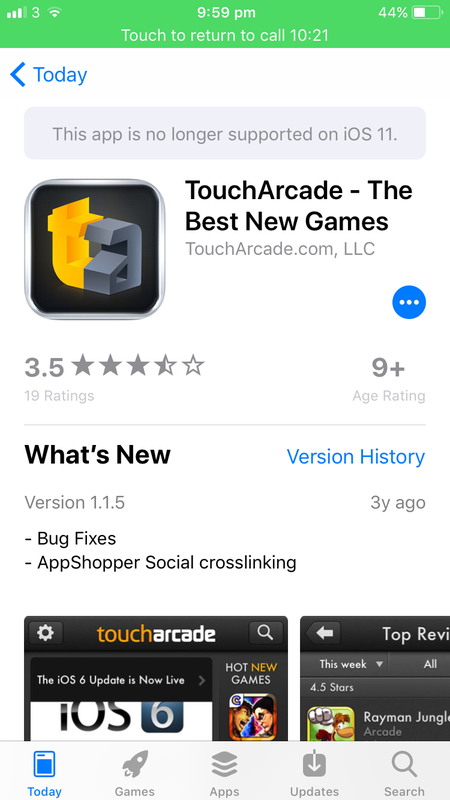 Thanks to D3ATHST3P from our Discord server for sharing the image of TA app on iOS 11 with us.